Visitors to Bermuda can now complete an immigration arrival card online before they fly, saving time and making their experience through the airport more frictionless, the Bermuda Tourism Authority said today. “Meantime, the move improves business intelligence gathering for marketers and could result in greater visitor spending by alerting travellers to events, activities and experiences while they’re on the island,” the BTA said. 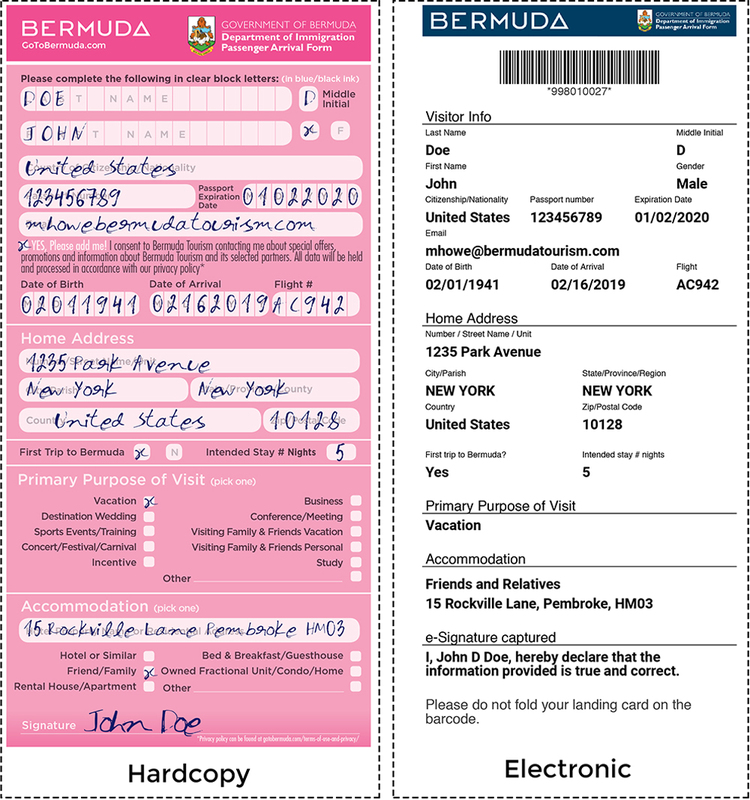 The BTA explained, “Currently visitors who fill out the Visitor Arrival Card online at BermudaArrivalCard.com must print it and bring the document with them when they travel. In the next phase, the process will be paperless, allowing travellers to show their completed form on a smartphone. “Tourism marketers see the move to a digital airport arrival as a big win for the industry. It’s the first time the Bermuda Tourism Authority has access to detailed information about specific visitors before they arrive. Currently, with a handwritten form, the information isn’t physically entered into a database until days after the visitor has left. And sometimes there are data entry errors due to illegible handwriting. “Now, with accurate information from visitors in advance, tourism officials can send pre-arrival marketing messages via email, if the visitor has opted in. In the future, travellers can receive topical messages on where to eat and which events to attend while they’re out here. The potential positive impact on visitor spend and experience is substantial. It is not the filling out of the forms that is frictionless it’s how rude some of our customs agents are. Lets get it right now!!!!! I dont find them rude. Two thumbs up on the digital form option! Please can we have an updated /digital version of the Residents Customs Declaration Form? We don’t usually get them until we are midway thru the return flight. You have to rush and go thru the receipts and separate everything into categories on a seat tray. Heaven forbid you should make an honest error in your calculations…you are treated like a criminal by some (not all) Customs Officers. Its not necessarily what they say – but how they say it! Better to grab a handful of forms so you can sort your receipts and fill out the form in your hotel room. How about we digitize the Work Permits and Spouses of Bermudians letters so that when a passport is swiped, voila, it pops up on the screen at immigration!! The days of carrying a piece of paper for this need to be long gone.